On Day 83, I rode 26.6 miles across northeastern Kansas. Starting the ride at the Pony Express Museum at the corner of North 4th and Main Streets in Seneca, I rode to the southeast along a series of country roads. As you can see from the changes in incline, this is rolling terrain with lots of ups and downs. I went south on South Fourth Street out of town, east on Road 140 and then south on Highway 68. I turned east on Kelly Road [120th Road] and south on what appears to be S Road. I passed near the Log Chain Pony Express Station [39°46'22.9"N 95°54'06.0"W - SW1/4-S19-T3S-R14E]. From here, I went east on 112th Road, south on U Road, east on 104th Road, south on U4 Road, east on 96th Road, south on Bittersweet Road and finally east on 140th Street. 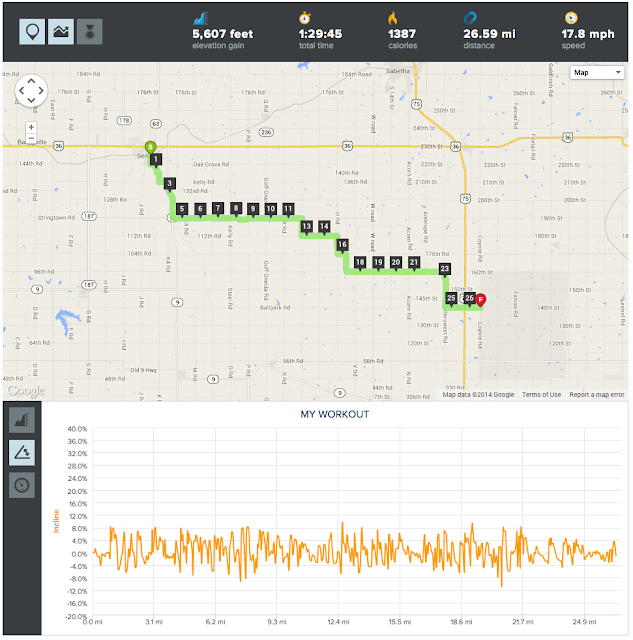 I ended the ride near the Kickapoo Pony Express station [39°42'39.2"N 95°42'49.5"W - S14-T4S-R15E].